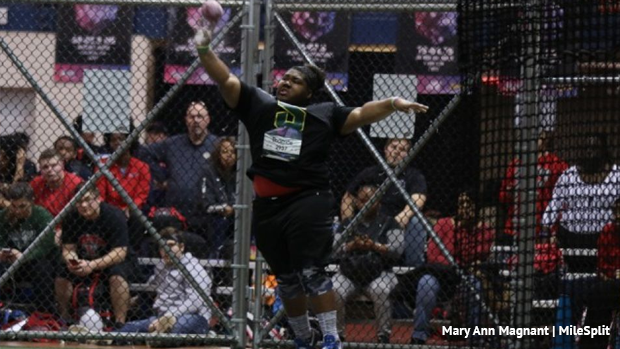 NEW YORK - Zyra Thomas pulled off a shocking victory when the senior at Schalick launched a historic and huge personal best throw of 47-5.75 to capture the girls shot put title in upset fashion at the New Balance National Indoor Championships on Saturday at the 168th Street Armory in Manhattan. Thomas, who came into the meet with a PR of 45-5, exploded with her two-foot plus PR bomb on her third throw of the trials as she edged Payden Montana of Berwick, Pa., second with a 47-2.5. Thomas is the third straight New Jersey girl to win the shot put at NBIN. Nickolette Dunbar of Whippany Park (now at LSU) won in 2016, and Alyssa Wilson of Donovan Catholic (now at UCLA) captured the title last year. Wilson is the national high school indoor and outdoor record holder in the shot put. Shelby Bigsby of Montclair, who came into the meet with a US #1 throw of 50-2, placed sixth with a 45-0.5. Thomas, who came into the indoor season with PR of 43-7.25 that she threw to place fifth at the Meet of Champions June finished second to Bigsby at the N.J. Meet of Champions last month. According to South Jersey track and field expert Reuben Frank, the 47- 5 ¾ by Thomas shattered the South Jersey indoor record of 46-1.5 set last year by Najeaya Singleton of neighboring Vineland at the state Group 4 meet, and the overall S.J. mark of 47-1.25 set by Cherokee's Jessica Woodard of Cherokee at the 2013 outdoor Meet of Champions. Woodard placed third for Oklahoma in the shot put at the NCAA Championships this past Friday. Thomas is the first athlete (boy or girl) from the Tri-County Conference to win a New Balance Indoor National title.